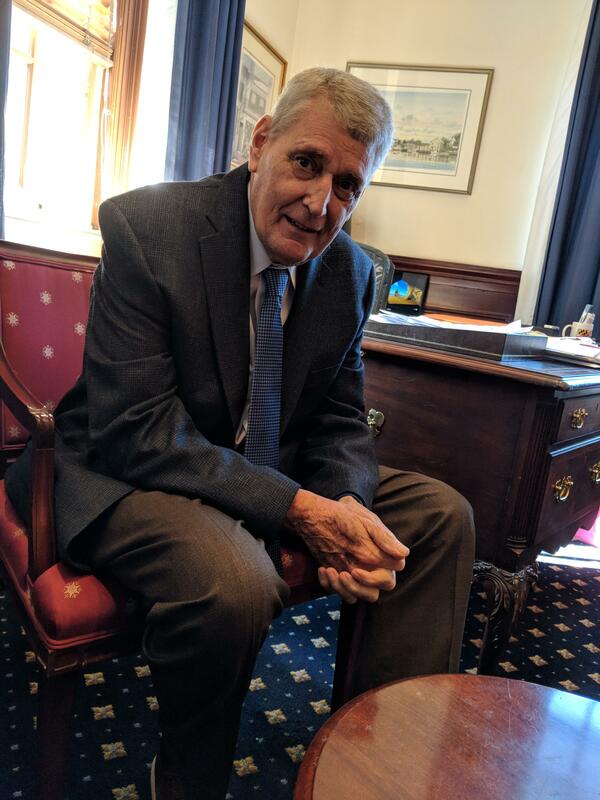 House Speaker Michael Busch sits for an interview in January 2018. In a highly unusual move, the legislature ended its official business 30 minutes early. The House and Senate then had a joint session to honor Busch. “Speaker Busch was my friend, leader, mentor and certainly a coach to all of us that serve in the House of Delegates,” Baltimore Del. Talmadge Branch, the House majority whip, recalled during the tribute. The last day of the session — known by the Latin Sine Die — is usually a flurry of activity, as legislators hold impromptu committee votes and negotiate compromises on contentious bills. But this year, most of the major legislative battles were settled before Monday. The small number of high-profile bills left unfinished coupled with Busch’s absence created a more subdued tone than normal. “It’s hard to imagine that we’re going to close out this 439th legislative session without a guy who’s been a leader of the House for the past 16 years and who’s been really an institution in the institution of state government for 32 years,” Gov. Larry Hogan said to reporters Monday afternoon. Senate President Mike Miller acknowledged at the start of the day that closing out the session without Busch would be tough for everyone. In the House, Speaker Pro Tem Adrienne Jones presided for the last couple weeks while Busch was out with pneumonia, and she continued to lead the chamber on Monday. With her dress, Jones wore New Balance sneakers, just as Busch wore when he knew the floor sessions would run long. She said the choice was part remembrance and part practical. One of the few big fights of the night was over the “Clean Energy Jobs Act,” which requires the state to get half of its electricity from renewable sources by the year 2030. The House and Senate also reached a compromise on a bill creating a “Prescription Drug Affordability Board,” with the power to cap the amount Maryland residents pay for certain drugs. And the legislature wrapped up one of Busch’s priority bills. It prohibits oyster harvesting in five waterways. Hogan vetoed it, but the House voted to override the veto on Friday, and the Senate followed suit Monday morning. But at 11:30, everything stopped.